Yes, New Orleans is a drinking city with a thriving bar scene, but its allure goes way beyond the wild partying on Bourbon Street. It’s still easy to take in all the city has to offer — while completely foregoing the drinking aspect. Plus, the vibrant culture and over 300 years of existence ensure that New Orleans appeals to all ages, on any budget. Just like you can do it the kid-friendly way, there are as many attractions and adventures that you can experience if you’re a senior. And the same goes for exploring the French Quarter if you’re under 21. Here’s what we recommend for the young people below legal drinking age, including teens and college students. Just taking in the many sights and attractions of the French Quarter on foot is enough to make even the most jaded traveler swoon — the Creole cottages, luscious courtyards, all that wrought iron — tend to have that effect. So hop off Bourbon Street onto the much quieter Royal Street, and take in all the architecture and shopping it has to offer. From browsing its many antique stores to checking out the street performances in the pedestrian mall between St. Louis and St. Ann streets that’s closed off to traffic — Royal Street is fun, trust us. Similarly, you can catch some great live music and just soak up the vibe on Frenchmen Street — without having to enter any of the clubs and bars. It’s best to hit Frenchmen in the evening, and there’s usually a great brass band playing on the corner of Chartres. And the enormous Louisiana Music Factory is your one-stop shop for all things related to the state’s considerable musical heritage. While we recommend walking all over the French Quarter because it’s so worth exploring, Decatur Street is another highlight. Not only it will take you to Jackson Square and to the Riverfront across the street but it’s great for people-watching, souvenir-shopping, and enjoying some live music in a family-friendly restaurant with outdoor seating, like The Market Cafe or Gazebo Cafe. 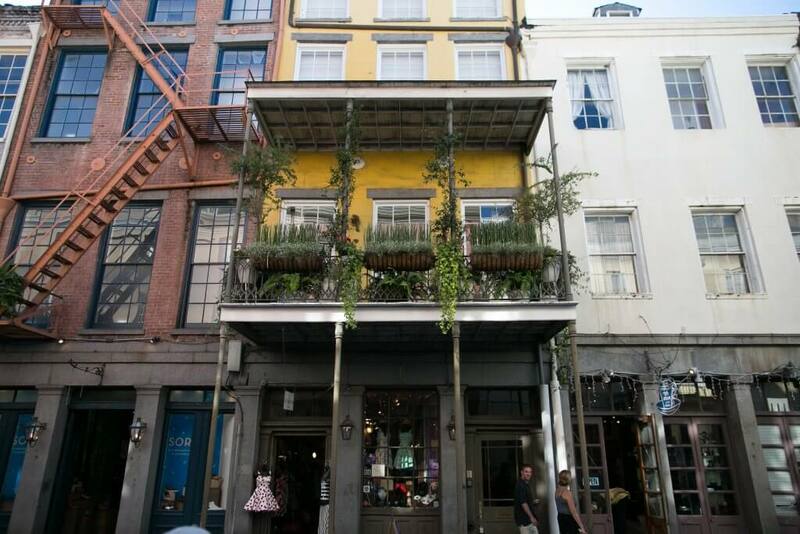 Unwind and lounge the day away in one of the French Quarter’s excellent cafes. Many sport outdoor seating — always great for people-watching — and delicious food. The grand dame of cafe au lait and beignets needs no introduction since it opened in 1862, so let’s just say no visit to New Orleans would be complete without getting powdered sugar all over yourself. Hectic yet charming, Cafe du Monde is open round the clock, and is busy at all hours. Almost everyone coming to New Orleans has heard of Cafe du Monde, but Cafe Beignet (with three locations in the Quarter) seems to fly under a lot of radars. We especially recommend the Royal St. location, on a quiet, pretty block where the main company is begging pigeons and sparrows. We also recommend the Envie Espresso Bar & Cafe (1241 Decatur St.), an airy coffeehouse with comfortable sidewalk seating, popular with the locals. It has a full bar and a big breakfast menu, plus small plates. Its second location, 308 Decatur St., features a smaller menu of breakfast sandwiches and quiches. Thanks to the New Orleans’ French and Spanish roots the French Quarter offers some of the best European-style patisseries. Salon Restaurant by Sucre is located above the Sucre boutique at the intersection of Conti and Royal Streets and serves freshly baked pastries, desserts and sandwiches. And please don’t miss Croissant D’Or, tucked away between Royal and Chartres on Ursulines. Steeped in old-world charm, this Parisian-style patisserie has some of the best baked goods in the city. The sweet and savory croissants, and everything else you’ll find displayed in the gleaming glass case — the tarts and the tortes and the quiches — is delicious and served fresh daily from the bakery. If you want a quick, inexpensive meal any time of day or night, with some local color thrown in, some spots are just unbeatable. If it’s late at night and you “need” a po-boy, head on down to Verti Marte, a tiny 24-hour takeout-only deli on Royal St. with a loyal following. 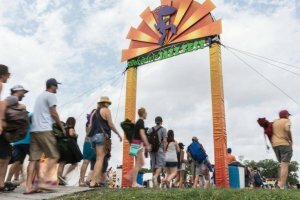 There’s plenty to love on the menu of this bastion of calories, but you can’t go wrong with the epic specialty sandwiches like the vegetarian Green Giant and the mountainous All That Jazz — with grilled ham, turkey and shrimp, plus two cheeses, grilled veggies, and the special “wow” sauce. Another takeout/delivery 24-hour institution is the Quarter Master Deli, also known the Nellie Deli. Quarter Master’s menu is full of burgers, overstuffed po-boys, house-made salads, and other New Orleans-style Southern fare like BBQ chicken and ribs. There are also a hearty breakfast and late-night menus. Central Grocery, a sprawling old-fashioned grocery store on a buzzing block of Decatur Street, is not called “Home of the Original Muffuletta” for nothing. Its founder, a Sicilian immigrant named Salvatore Lupo, is credited for creating the famous sandwich. The store is still lovingly run by the same family, and is packed full of imported Italian delicacies, including the famous olive salad by the jar. Central Grocery is worth a look for that reason alone, but it’s the made-to-order muffulettas that have the visitors and the locals flocking there since 1906. You can eat in at one of the few tables in the back, or take your muffuletta to go. At the small and cozy Bennachin, you can sample flavorful African dishes with origins from Gambia and Cameroon. The restaurant was also one of the first places in New Orleans to feature vegan items on its menu. Right next to Bennachin is another comfy, cozy spot, the Mona Lisa, decked in the namesake’s-centric art floor to ceiling, and serving some of the best (and most inexpensive) pizza in the Quarter. Going back to Frenchmen St., we recommend Mona’s Cafe (Lebanese specialties like excellent falafel and kebabs in a super casual setting) and Dat Dog. Not only Dat Dog’s dogs and sausages are pretty amazing but there’s balcony seating overlooking Frenchmen, and the second floor filled with decorations culled from the Krewe of Chewbacchus (the city’s science fiction/fantasy themed Mardi Gras krewe). Everyone comes to New Orleans with their own bucket list, and trying some culinary classics is often of it. 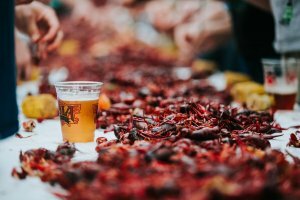 If you’re in that number, the Quarter is teeming with great restaurants, from casual holes in the wall to the chandeliered legends, where you can try some of the best, most iconic New Orleans fare like jambalaya, gumbo and muffalettas. Many New Orleans restaurants serve jambalaya, but these French Quarter standouts take it to another level. The jambalaya at the upscale Cajun/Creole eatery K-Paul’s Louisiana Kitchen, founded by the late celebrity chef Paul Prudhomme, is dark, smoky, and comes in a shareable serving size. The New Orleans Creole Cookery serves up both Creole and Cajun versions of gumbo along with the vegetarian version (not something many restaurants offer here). And, at storied Napoleon House, the spice jambalaya is a specialty that could be ordered as either an appetizer or a side. Most restaurants include at least two versions of gumbo on the menu, the meat and the seafood. You can get a cup alone, or a cup with half of a po-boy, if you don’t want to commit to a bowl. You would want to, though, if you happen upon the gumbo served up at the classic Creole restaurants like Antoine’s or Arnaud’s. For the more casual yet no less delicious takes head to the Gumbo Shop (the name says it all, and there’s a rarely-seen on the menus around the city veggie version, gumbo z’herbes), Vacherie, or Acme Oyster House. Acme also offers gumbo as part of the New Orleans Medley Sampler or in half-of-po-boy/cup of gumbo combos. There are so many ways to explore the Quarter — on foot or bike; aboard a big red double-decker bus, mule-drawn carriage, rickshaw, or segway. If you’re looking for a self-powered, self-guided adventure throughout the ancient streets, many local companies will let you rent a bike for several hours and up to several days, and most of the time helmet, bike lock, maps, and “concierge support” are included in the rental fee. Though slowly, New Orleans is getting more bike-friendly with the recently repaved roads, new dedicated and shared bike lanes, and increased bike safety awareness. And, hey, no hills! The history of the French Quarter in particular is teeming with ghost stories, so what better way to learn about the city’s often turbulent and sordid past that taking a ghost tour? And, if you want to get off land for a few hours, there’s no better way to see the mighty Mississippi than to a cruise on the Creole Queen. Stay cool indoors and learn about local history at the same time at one of the numerous French Quarter museums, all within walking distance from one another. We especially recommend the Old U.S. Mint with its collection or coins, stamping presses, and the “New Orleans Jazz” exhibit; and the New Orleans Pharmacy Museum, housed in the former 19th century apothecary shop and filled with cool surgical instruments and patent medicines. Both the Cabildo and the Presbytère, which flank the St. Louis Cathedral, are run by the Louisiana State Museum. The Cabildo houses such precious artifacts as a painting of Marie Laveau by Frank Schneider and a rare Napoleon’s death mask. A former courthouse, the Presbytere contains two permanent exhibits. The dazzling “Mardi Gras: It’s Carnival Time in Louisiana” tells the story of Carnival traditions in Louisiana, including Cajun Courir de Mardi Gras, Zulu coconut throws, Rex ball costumes, and much more. The “Living with Hurricanes: Katrina and Beyond” exhibit documents the natural disaster, its aftermath, and the ongoing recovery with interactive displays and artifacts. Some of the city’s most popular clubs and music venues allow visitors ages 18 and older, like, for example, House of Blues. For more traditional live-jazz entertainment for all ages, check out Three Muses, Snug Harbor, Palm Court Jazz Cafe, or the legendary Preservation Hall. Another way to experience the lively sounds of New Orleans jazz is to partake in the delicious weekend tradition of brunch. Many local restaurants serve hearty Creole and Cajun menus alongside live jazz. Party like a local on St Patrick’s Day.